If you build it, you can bet theyll lock their bike up on it. You can prevent damage to playground equipment or park furnishings, such as tables or benches, by providing strategically placed bike racks. Make your park more friendly and welcoming to cyclists while preventing injuries from bikes tethered to trees, fences, etc. 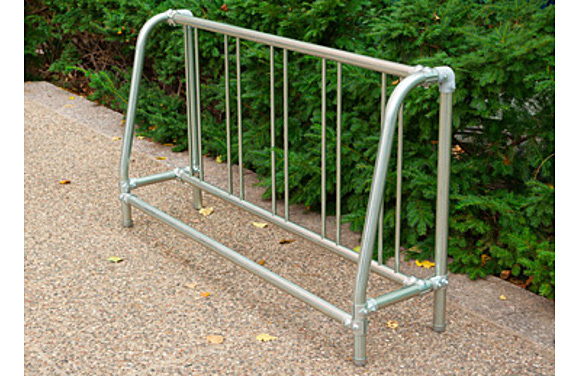 The Traditional Single-Sided Bike Rack is the classic American style offering storage on one side only, for 5 to 10 bicycles depending on the model selected. It is one of our most popular styles for its timeless design and sturdy construction. Like most of our bike racks, these are designed to require minimal space and to allow for bikes to be supported at two points, which helps prevent damage and theft. They also meet the recommendations of the Association of Pedestrian and Bicycle Professionals (APBP). Available in an in-ground, portable or surface mount option. Complies with ASTM and CPSC specifications. Available in 5 length (five bike capacity) to 10 length (10 bike capacity). A ten year warranty is provided. Please consult with us for appropriate installation guidelines. Proper maintenance of equipment including scheduled tightening of bolts, nuts and setscrews is required as well as inspection of concrete footings and ground surfaces. 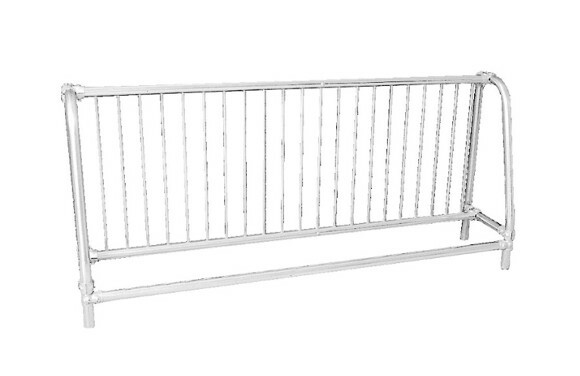 American Parks Company offers a number of commercial quality Bike Racks to suit virtually any business or recreational theme. We have assisted schools, churches, HOA property management professionals, and other organizations to integrate safe bike storage in parks, outside of businesses, and in public recreational spaces. 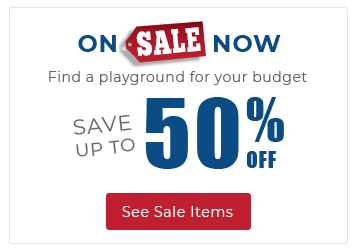 Call us for more information at 1-800-381-4491.